The TIRAK Traction scaffolding hoist is a motorized hoist with a wire rope which passes completely through the machine. The TIRAK has been specially designed for suspended access applications. The originality and the reliability of its wire rope driving system make the TIRAK the ideal lightweight, sturdy and safe hoist for suspended scaffolds and working platforms. Unlimited working height: the wire rope not being stored in the machine the TIRAK can operate on practically any height of lift. Exceptional capacity: The unique high capacity models 1t and 2t can be used for heavy working platforms, multideck suspended scaffolds, etc. Safety is paramount: The simplicity and the reliability of its design make the TIRAK Traction scaffolding hoist an extremely safe machine. Positive proof: the TIRAK has been approved as a manriding hoist by safety organizations all over the world. In North America they are UL listed and CSA approved. 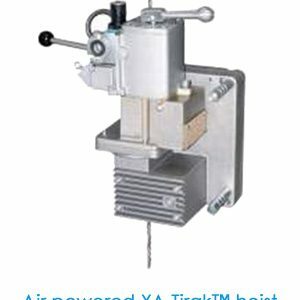 Controlled descent: All TIRAK models are equipped with a centrifugal mechanically controlled descent device to lower the scaffold in case of power failure. The principle: The TIRAK scaffolding hoists operates on the principle of wire rope travel using adhesion pulleys. The originality of the system is in the operation and arrangement of the pulley(s). 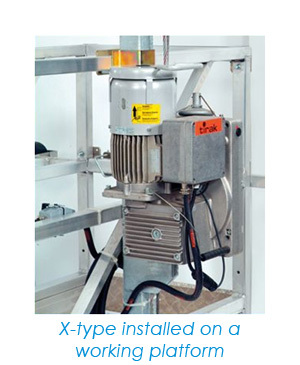 The units of the X series have a single drive pulley. The grip of the wire rope in the pulley is made by a set of rollers operated by a pressure spring. The units of the T series have two pulleys, one positioned above the other. Each pulley consists of a pressure disc and a drive disc, pressed against each other by preset high duty pressure springs. The wire rope travels around the two pulleys along an “S” path. 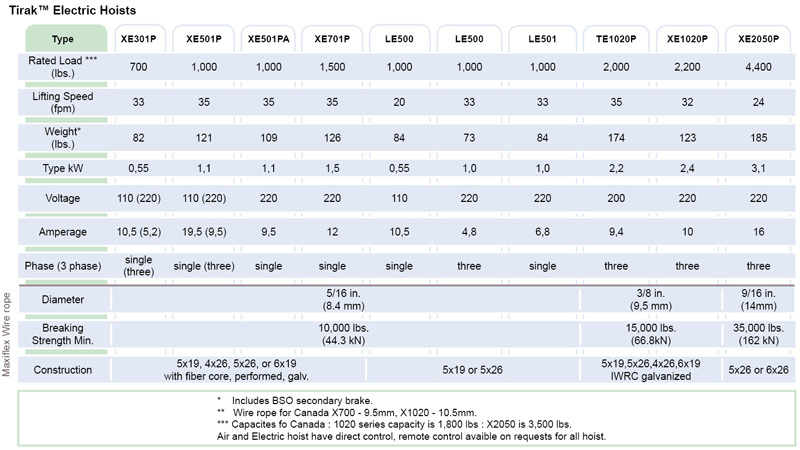 **** Capacities for Canada: 1020 series capacity is 1800 lbs. ; X2050 is 3500 lbs.